This post was updated on 09/15/2017. Warning: there’s a very important element of your real estate website that you’ve probably been overlooking. You know, the text or image that you want your visitors to click on to take the next step — like emailing you, filling out a form, subscribing to your newsletter, or following you on Twitter. 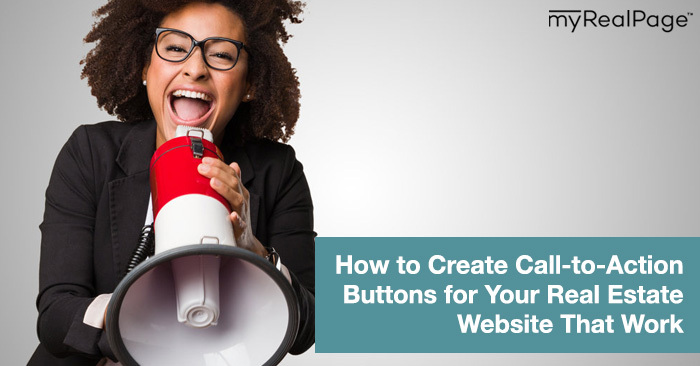 To get you thinking creatively about your own call-to-action buttons, we’ve outlined three effective approaches. Just remember: as with any part of your marketing strategy, experimentation is key. If your buttons aren’t getting the kind of traction that you want, try a different approach until you see improvement. And don’t cover your website in CTAs — multiple buttons on every page will do the exact opposite of what you’re hoping for. The most effective calls-to-action are often the ones that promise value that can’t easily be found elsewhere. You want your website visitors to feel that by clicking on a button, they’ll be granted easy access to something they need and want. Don’t give your website visitors time to mull it over. Create a sense of urgency that will have them forking over their email address and signing up for emails right away. How? By creating a time limit around the value you’re offering. Your goal with this kind of CTA is to make your visitors feel as though they’re missing out on something great if they don’t click your button right away. To do that, your promised value needs to be good (a list of open houses isn’t the best for a time-sensitive offer; a free home consultation is) and the window of time needs to be short (an offer that expires in a week creates much less urgency than one that expires in hours or days). Sometimes the most effective CTA is the one that’s simply charming, funny, clever or personable. Not every CTA needs to offer a freebie. But those simple, to-the-point calls shouldn’t be boring (“Sign up for my newsletter” isn’t a very exciting button on your site). Show some personality, while remaining succinct and on-message. Oh, and on that note – keep your CTA voice consistent. Do all your buttons talk to your visitor (ex: “Grab Your Buyer’s Kit Here”)? Keep doing that. Do your CTAs speak in the voice of your visitor (ex: “Gimme That Buyer’s Kit!”)? Then keep on keepin’ on. Consistency is key – even in the tone you choose to use in your call-to-action buttons. What calls-to-action are working for you? Share your tips below.